As you probably know, the so called “Renaissance” started in Italy around 1400 and the Renaissance in Northern Europe followed a few decades later. The Renaissance is characterised by a renewed interest in forgotten beliefs and cultures, a rapid development in the current beliefs and cultures and a disengaging from the scholastic Middle Ages. “A rebirth of paganism” or similar expressions you will run into frequently. Indeed, for the Southern Renaissance this is very clear. The libraries in the South of Europe were stuffed with ‘pagan texts’, classical mythology and ancient philosophers. These were rediscovered and however Christianity was stronger than ever, art, architecture, literature and philosophy used the pre-Christian imaginary like never before. So what happened when the Renaissance found its way to the more Northern parts of Europe ? Well, we usually hear that not only the styles of art, but also the imaginary of the Southern Renaissance were taken over. So also here Jupiter, Apollo, Venus and Mars. This is not only a pity, it is also strange. If the mind of the Renaissance would have taken root here too, the old Germanic/Teutonic, Norse/Icelandic and Celtic gods should have taken a high fly. Unfortunately, this was not the case, at least, not at first sight. This is strange, because it was in the ‘dark’ Middle-Ages that valuable texts where written down. Just think about the grail-legends that were put to paper around 1200 by people such as Chrétien de Troyes (1135-1183), Robert de Boron (±1200) and Wolfram von Eschenbach (±1170-1220). In the same time Snorri Sturluson (1179-1241) lived. This Icelander we of course know for the Prose Edda or Younger Edda and the Heimskringla or ‘history of the kings of Norway’. Saxo Grammaticus (1140-1206) wrote the famous Gesta Danorum or ‘history of Denmark ’. However famous these texts are nowadays, there seems to have been little interest in them in those days. Most of the texts were not published until the 17th century. There seems little information about the period in between, the Renaissance. A book with a promising title was released in 2002. The Pagan Dream Of The Renaissance by Joscelyn Godwin(*1). This book -however- speaks only about the Southern Renaissance and the Southern form of the Northern Renaissance. Too bad. Looking further I soon noticed that this subject is not too well investigated. Only a handfull of scholars seem to have written about the Northern tradition in the Northern Renaissance. Most often their works are not even about this subject, but it is only touched upon in the course of something else. Yet, my interest was sparkled by an article. The article that triggered my interest in the subject was published in the second volume of the magazine/book Tyr(*2). The article was written by Stephen Edred Flowers and is called The First Northern Renaissance. Flowers says that “during the Middle Ages, Germanic culture survived in the vibrant form of (secular) heroic myth as well as in (ecclesiastical) religious ritual.” (p. 182). Also he speaks about a “Germanized Christianity” that was brought to Scandinavia and about printed mythology during the Reformation. Not too much information for the first part of my own article, so let’s pursue. About 300 years after the writing down of the Eddas, sagas, histories and law-texts there was again an interest in native history(*3). The Swedisch bishop Johannes Store (better known with his Latin name “Johannes Magnus”, 1488-1544) and his brother Olaus (1490-1588) each wrote about the history of their country, so did Johannes Messenius (1579-1636) a century later. History also inspired poets. The German poet Ulrich von Hutten (1488-1523) who wrote a poem about the famous Cheruskian (a German tribe) Arminius/Hermann (17 BCE-21 CE) who was victorious over the Romans in the year 9 CE. Literature and history kept an interest in the native history for a long time. The Swedish poet Georg Stiernhelm (originally Jöran Cuprimontanus Lilja, 1620’s) combined runology with poetry, Stephan Stephanius (or Stephan Hansen or Stephanus Johannes, 1599-1650) was still interested in his native Danish history. And in the 17th century official university professoral chairs and museum dedicated to the native past were founded in Denmark , Sweden and Iceland . This last thing brings us a bit further than the time I wanted to speak about. An interesting online article was written by Regina Jucknies(*4). As the title The Export Of Islandica in the 17th Century suggests, the article is about how many of the Islandic sagas and other literature moved to Sweden and Denmark. A man named Arngrímur Jónsson lærði wrote a book called Epistola Pro Patria Defensoria (1618) about this fact which he was not happy about. The book got much attention, but not with the result the writer was looking for. “Danish historians became interested in the stories told in the sagas, believing that they contained information about the cultural heritage of not only Icelanders but also the old kings of Denmark and the Scandinavian peninsula .” Snorri’s Heimskringla was translated into Danish in 1633 and many similar texts were taken away from Iceland, emptying it’s libraries. As some sort of ‘counter action’, the Icelandic bishop Brynjólfur Sveinsson (1605-1675) hired Jón Guðmundsson lærði (also Björn Jónsson á Skarðsá, 1574-1658) to start copying Eddic poetry, sagas and law texts to preserve them for Iceland too. Now Brynjólfur makes a link to other sources of infomation that I used. Jucknies says that Brynjólfur had a lively correspondence with a few important Danes, such as King Fredrik III (1609-1670) to whose servent Thormod Torfaeus, Brynjólfur gave the famous Codex Regius which contains the so called Elder Edda or Poetic Edda in 1662(*5). The texts were published by Peder Hans Resen (1625-1668) in 1665. Further Brynjólfur was in contact with Ole Worm, with whom we come to an interesting point in our investigation. But first something else. In the article of Jucknies, a man named Olaf Rudbeck (1630-1703) is mentioned. In his book Alland Eller Manhem, (‘homeland of all people?’) Rudbeck tried to prove that Sweden was Plato’s ‘Atlantis’. Rudbeck was not particularly original with this idea. Besides, the idea of Scandinavia being the source of (the ‘good part’ of) humankind seems to go hand in hand with the search for the original language. The Dream Of A Perfect Language(*6) was a lecture that Umberto Eco held in 1996 and which can be found online. It has a few nice leads. “17th Century Irish grammaricans” for example, said that Gaelic was the language that was spoken before the confusion around the Tower of Babel and was thus the original language. Dante Alighieri (1265-1321) already said something similar: the perfect language was lost after the Babel disaster of tongues. However many scholars of the Renaissance saw Hebrew as the ‘Adamic language’, there were other theories, such as the Gaelic original tongue (even Gottfried Wilhelm Leibniz (1646-1716) thought this), but even that Dutch, or more in particular the dialect of Antwerp in Belgium was the mother of all languages! Jan van Gorp (or Goropius Becanus (1518-1572)) said that “the ancestors of Antwerpians were the Cimbriants, the direct descendents of the sons of Japheth who had not been present under the Tower of Babel and thus kept the perfect language” (Eco). Japheth is one of the sons of Noah and we will see that more people had similar ideas about the perfect language coming from Japheth, or the perfect people descending from him. Guillaume Postel (1510-1581) wrote a very interesting book about the original of languages. However he said that this was Hebrew, Postel supported “a revival of Celtic Europe with an accompaning revolution of arts and sciences” (*9). More about this Frenchman later. Ole Worm (or Olaus Wormius, 1588-1654) was born in Århus. He had a proper education and also he studied in Germany and Italy . He certainly didn’t stick to one practise, but two of his interests are interest of ours in this story. Worm was one of the first to study the rune-stones that could be found throughout Denmark (he also wrote a rune-calender), also he has been in contact with the early Rosicrucians. This last point is of great interest to me, because I am interested to find out if there were people who mixed traditional Northern magic with other Renaissance kinds of magic such as Kabbalah, alchemy or Medieval sorcery. In a few of his books the librarian of the Dutch ‘Bibliotheca Philosophica Hermetica’ Carlos Gilly says that during his stay in Germany in 1611, Worm got to read a copy of the Fama Fraternitates before it was published(*8). The Fama was the first of the Rosicrucian manifestos coming from Germany. The Fama was published in 1614, but had been going around as manuscript for a few years. It was the Marburg professor in chemistry Johann Hartmann who showed Worm the copy. The city of Marburg would become a stage for reactions to the Rosicrucian manifestoes. The Rosicrucian ‘movement’ started with the publishing of three manifests in the early 17th century. Nowadays scholars don’t think that there really was an organised Rosicrucian movement, but there was a group of students in Tübingen (Germany) who frequently met and wrote the famous texts together. One of the persons in this group was Tobias Adami (?-1643). Adami had a great interest in his Italian contemporary Thomasso Campanella (1568-1639) and brought his writings to Germany. Adami published Campanella’s De Sensu Rerum et Magia (‘on the meaning of things and on magic’) which already speaks about the ‘magnet of the North’ and other things that could make the Northern European proud about his heritage. However this certainly is an underlighted aspect of the early Rosicrucian movement, Adami completes Campanalla’s texts with his “Germanos Philosophos” in his 1617 edition. This interest of Rosicrucians in ‘Nordic subjects’ is something I would like to investigate further. One of the most famous Renaissance esotericists from Scandinavia is the Dane Tycho Brahe (1546-1601). He was a famous astronomer who -like Postel, John Dee and many others- wrote about the new star (the supernova of 11/11/1572) which would have a vast influence on the coming Rosicrucians. Brahe died before the Rosicrucian manifests were published, but he would probably has been grasped by the texts if he got to see them. Also I think it is very possible that Brahe was aware of the ‘Rosicrucian substream’ that lead towards the manifests and/or influenced them. Tyge Brahe was born the only surviving brother of twins, raised by an uncle Jørgen Brahe who was in contact with queen Sophie. Shortly after Tyge was born, the reformation arrived in Denmark and Luther (1483-1546) had a lot of influence. Immediately followed the ideas of Philipp Melanchton (1497-1560) who built a school and university system so also Denmark got itself a university. It was not yet very normal to attend a university, but Tyge was one of the lucky few. There he learned Latin and a little Hebrew and caught an interest in mathemetical sciences (arithmetics, geometry, astronomy and music). Only 15 years of age Tyge for the first time used his Latinised first name. At the same age Tycho went to Germany to go to the university of Leipzig. This was no big change, because the university of Copenhagen used the language high-German. Going there Tycho first met the 20-year-old Anders Sørensen Vedel (1542-1616). Because everybody on the international university had a Latin name, Vedel became Andreas Seurinus Cimber and Tycho, Ticho Brahe ex Scandia. Early in his Leipzig years Tycho secretly studied astronomy and astrology. Vedel and Brahe became lifelong friends, but were not at the same place the same time always. When Tycho first moved back to Denmark and later to the Wittenberg (where Melanchton founded his first university) university, Vedel was already there. When an epidemic forced the students to move on, Brahe went to Rostock where he was introduced to the ideas of Paracelcus (1493-1541) by Peter Sørensen which Brahe took notice of enthousiastically. As you can see, Tycho was interested in astronomy, published about the new star of 1572 and was interested in Paracelcus, all of which heavily influenced the Rosicrucian writings, but there is more. A man named Steen Bille had a circle of thinkers (mostly relatives) around him in which Tycho was involved too. Steen and Tycho had a vast interest in alchemy (just like the Rosicrucians) and in this group something even more interesting took place that I will come to later. Other than this Brahe had a lively correspondence with “the Augsburg” circle including Hieronymus (Jerome) Wolf (1516-1580, historian and humanistic scholar), Paul Hainzel (major of Augsburg interested in astronomy), J.H. Hainzel (who would become “the patron of Giordano Bruno”(*13)) and Johannes Major. 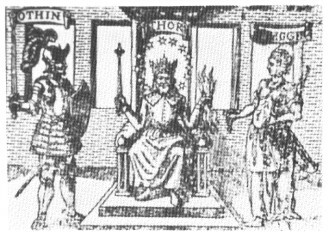 Tycho also was very welcome at the court of the “Hermetic emperor” Rudolph II (1552-1612) where he met alchemists, scientists and undoubtely heard about the Rosicrucian manifestoes. More interesting in our story is that Brahe bought a copy of the Gesta Danorum in Leipzig in 1563. The famous Gesta Danorum is a 12th century history of Denmark in which the Christian writer Saxo Grammaticus mixed history and mythology and made a vital source for information about the Northern beliefs. The book was (as far as I could find out) largely unknown and it is striking that a Dane found a copy of it in Germany. This fact I found in only one internet article(*7), but in his book The Lord Of Uraniborg, a biography of Tycho Brahe(*13) Victor E. Thoren has a few interesting references as well. The book of Thoren mostly focuses on Tycho the astronomer, but in the course of his biography some interesting points come up. I mentioned Vedel earlier, Tycho’s longtime friend. Vedel was an historian, who was inspired by Johan Friis (1494-1570) to write about the history of Denmark. Thoren writes: “It was certainly he who bequethed to Vedel the unfinished translation of Saxo Grammaticus that eventually emerged complete, as Vedel’s contribution to Danish history and culture.” (p.41, also see p.206/7) Unfortunately Thoren does not say who got the book in the first place and who started the translation. A fact is that Tycho followed Vedel’s actions closely and supplied him at his own costs with paper (not very easy to get in those days) to publish his translation when he finished it in 1575. Tycho definately took a warm heart towards the famous Gesta Danorum. Also very interesting is that the circle of scholars around Steen Bille that I shortly touched upon included a Jens Bille who “was a student of runic writing and practised his command of the ancient Nordic alphabet by exchanging letters with two cousins, Bent Bille and Mogens Gyldenstierne.” (p.50) Unfortunately the names are too common and the persons too unknown to make me able to find more about this, but this was as early as 1560, that is even before the “first investigators of the runes” Ole Worm and Johannes Bureus (see below) were born!! There seems to have been a small circle of people interested in runic writing, alchemy and more. Definately something to try to find more about! It was not only Worm and Brahe in who Rosicrucianism -or at least Renaissance esotericism- and traditionalism came together. The earlier mentioned Frenchman Postel was a spider in a strange web of esoteric and religious groups and people. Postel has studied Hebrew, also he has studied Arabic, but it was not only linguistics that he was interested in. Postel is said to have supported a Celtic revival. Furthermore, Postel has been linked to the early Rosicrucians and also other esoteric or (radical) religious groups, but never convincingly. He did have profound influence on people with similar interests coming after him. “The spread of Rosicrucianism in Northern Europe” has been a subject of study for Susanna Åkerman (1968-) for many years. This subject has been underlighted for many years and I am very happy that Åkerman took up this interesting job. I never knew that Rosicrucianism was received to enthousiastically in the North. Åkerman’s investigations first (as far as I know) resulted in a slightly misplaced article in the book The Expulsion Of The Jews – 1492 and after(*9). Åkerman’s article is called The Gothic Kabbalah: Johannes Bureus, Runic Theosophy, and Northern Apocalypticism (pages 177-198). In this article Åkerman already shows quite some results of her investigation. More in length, these results can be found in her book Rose Cross Over The Baltic(*10), which has the subtitle I began this alinea with. Later Åkerman has published an article in a book edited by the earlier mentioned Carlos Gilly(*11). Because all of these books are quite hard to get for the normal reader (the first two are scholarly released and very expensive, mostly meant for university and not personal libraries, the last was released by the small publishing house of the Bilbiotheca Philosophica Hermetica in Amsterdam), I decided that an article will follow after this one. And so I coming closer to the end of this article. In the article The First Northern Renaissance Flowers speaks about a Swede called Johan(nes) Thomae Agrivillensis Bure(us) (1568-1652) in who all what came before came together. Bureus was born near the legendary place of Uppsala where the largest and last pagan temple stood. Bureus studied in Sweden , Germany and Italy , got interested in Medieval magic and Kabbalah and the rune-stones that were still very present in his day. Bureus learned to read the runes from farmers in the far North of Sweden and became the first Swedish runologist. Bureus probably knew Grammaticus and may have known an early manuscript of the Eddas. Then he started to develop an esoteric runology based on John Dee’s Monas Hieroglyphica (!) and wrote books to learn other people (like the Swedish royal house) how to read the runes. Bureus was also heavily influenced by Postel and he came to think not only that the Atlantis of Plato was Scandinavia , but also that the runes were the actual language of the sons of Japheth, the language that got away just before the Babel tragedy. Bureus worked out a complete system of Kabbalistic runology and wrote his booklet Adalruna Rediviva which was rewritten and explained by Stephen Edred Flowers(*11) of the American Runegild in the same year as Åkerman’s book came out. Åkerman is mostly interested in the Rosicrucian movement in Scandinavia , Flowers focusses on the esoteric runelore side of the man. Åkerman seems to be investigating more interesting Rosicrucian characters from Scandinavia not yet in her book, so I am looking forward to a possible new publication. Flowers is writing a trilogy called The Northern Dawn which (I think) will have about the subject of this very article. Let’s wait and see. In my search for a possible Renaissance mix between the traditions of the North and esoteric Renaissance thinking I kept running into Bureus who seems to be the only well documented (and justly, since he is very interesting) of such people, and since there is not yet any descent information about the man and his system, I have decided that the next article will be dedicated to him. Also I hope that I will be able to find out more specific information about some of the people and systems that I mentioned here. Maybe (maybe) this article will prove to be preliminary. (*4) Äderneslandets Antikviteter – the export of Islandica in the 17th century by Regina Jucknies. Online (PDF) here. (*5) The Masks Of Odin by Elise-Brita Titchenell, 1985 Theosophial University Press, ISBN 1557001375. (*5) The Dream Of A Perfect Language by Umberto Eco, lecture 26/11/1996, online here (PDF file). (*7) Gesta Danorum by Jan Baptist, internet article. (*8) Fama Fraternitatis by Carlos Gilly, 1998 Rozekruis Pers, ISBN 9067322091. (*9) The Expulsion Of The Jews – 1492 and after edited by Raymond B. Waddington and Arthur H. Williamson, 1994 Garland publishing, ISBN 081531681X. (*10) Rose Cross Over The Baltic by Susanna Åkerman, 1998 Brill, ISBN 900411035. (*11) Rosenkreuz als europäisches Phänomen im 17. Jahrhundert edited by Carlos Gilly, 2001 In de Pelikaan, ISBN 3772822061. In the course of my research for a continuing historical astronomical series on Galileo, Kepler, Tycho and the Church, I was directed to your article. What I found most refreshing is that your article contains information not usually included in the historical writings I often find on the net regarding Tycho Brahe. As a life long history enthusiast myself I appreciate the times when I find something both provocative and original…Bravo! You’re very welcome Roy. Currently finishing 16th century England & the Netherlands or States (Elizabeth I, Drake, Spain) but the the Rosicrucian Brotherhood, now that is interesting. I may just look into that as my next ‘just curious’ project. I have the feeling that the roots there are deep regarding that period, pre -and- post 1600’s if I’m correct. Especially dealing with that region of Europe (Ger. and the north) as it’s an area steeped in many histories regarding the society, mystics, religion and of course the Fama Fraternitatis amongst other things. center of a two-story, coffered ceiling with a catwalk on the edges containing the stacks. I know I”m out of my league, but I love it. I strongly recomend you Thomas Karlsson book on the subject (http://www.amazon.com/Adulruna-gotische-Kabbala-Thomas-Karlsson/dp/3939459046/ref=sr_1_1?ie=UTF8&s=books&qid=1263521224&sr=1-1). Unfortunately, I think there is no version of it in English, but I also think that if you know or understand German (what can’t be that hard if you speak Dutch). I wrote a few things about Bureus and reviewed some books. I was aware of Thomas’ book, but I think it was only available in Swedish when I was working on Bureus. I might, indeed, get the German translation some time too. Thank you for the hint. I am overwhelmed with the information you have about Johannes Bureus. He is my Swedish ancestor through Anders Olofsson. Anders was born 1425 and lived in Burea, Skelleftea parish. Jacob Andersson born about 1450 was a County Governor and lived also Burea, Skelleftea parish. (succeeding his father as Uderlagsman of Vasterbotten). Of their children Alders was born about 1480, his granddaughter Magdalena Andersdotter was mother to the famous Johannes Bureus. I would love to explore more deeply the spritiual roots of Johannes. The book that the previous commenter referred to is on the way and I will review it when I finished it.